If you are looking for a delicious low carb, and high protein pizza option that tastes better than that cardboard cauliflower recipe look no further! This Turkey Crust Pizza recipe is a take on my traditional Chicken Pizza Crust Recipe. Fresh basil, ripe tomatoes and creamy mozzarella make this Turkey Crust Pizza Margherita a winner in my book. The perfect low-carb option for pizza lovers! Let me know what you think in the comments below! Let me start by saying you can make this as easy or complex as you like. In the picture above I used roasted tomatoes and garlic. I know this isn’t typical of a Margherita pizza, but I had them on hand from a soup I was making. The Turkey Pizza Crust would taste equally as good with the traditional fresh tomatoes. Now that we have that clarified let’s get to cooking! Pre-heat the oven to 400* and line a cookie sheet or pizza pan with tin foil or parchment paper; whatever you have on had is perfect. I recommend using a pan with a lip because the juices from the turkey spilled in my oven (lesson learned). Many of you had concerns about the amount of grease on the other recipe just to clarify that liquid is juice not grease! Spray the foil or parchment with a bit of nonstick spray. 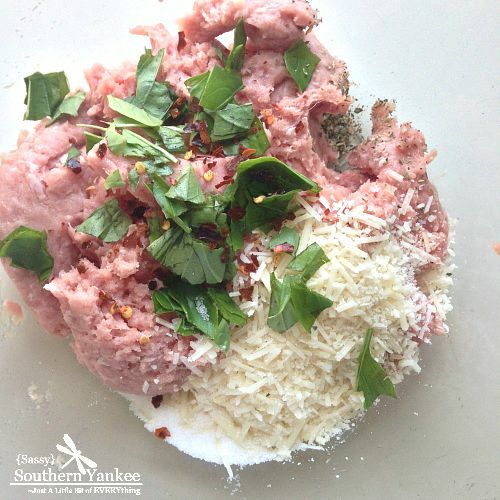 In a medium bowl add the ground turkey, chopped basil, 1/2 cup parmesan cheese, salt and red pepper; then using your hands mix all the ingredients together until evenly combined. Turn the turkey pizza crust mixture out onto the greased cookie sheet. Using the palm of your hand flatten out the mixture until it’s about 1/4-1/2 inch thick. Bake in the oven for about 15 min; then using a spatchula flip the crust over. If your pizza is on the ticker side allow it to cook until almost baked through. I don’t want anyone eating undercooked ground turkey. Now its time to add the toppings! I added the tomatoes (which I roasted in the oven for a bit to soften them and bring out the flavor but this is optional), basil, minced garlic and mozzarella sporadically on the pizza then added the remaining parmesan cheese. Bake for an additional 5 min or until the mozzarella is melted and bubbly. Drizzle with a bit of olive oil and fresh basil. If you wanted a bit more tomato flavor you could always add a bit of pizza sauce before adding the cheese. This made one pizza and I would recommend it serving two people as it’s about 6 oz of protein per person once it’s cooked. Fresh basil, ripe tomatoes and creamy mozzarella make this Turkey Crust Pizza a winner in my book. The perfect low-carb option for pizza lovers! Let me start by saying you can make this as easy or complex as you like. In the picture above I used roasted tomatoes and garlic. I know this isn't typical of a Margherita pizza, but I had them on hand from a soup I was making. The Turkey Pizza Crust would taste equally as good with the traditional fresh tomatoes. Now that we have that clarified lets get to cooking! In a medium bowl add the ground turkey, chopped basil, ½ cup parmesan cheese, salt and red pepper; then using your hands mix all the ingredients together until evenly combined. turn the turkey pizza crust mixture out onto the greased cookie sheet. Using the palm of your hand flatten out the mixture until it's about ¼-1/2 inch thick. Bake in the oven for about 15 min; then using a spatchula flip the crust over. If your pizza is on the ticker side allow it to cook until almost baked through. I don't want anyone eating undercooked ground turkey. Now its time to add the toppings! I added the tomatoes, basil, minced garlic and mozzarella sparatically on the pizza then added the remaining parmesan cheese. 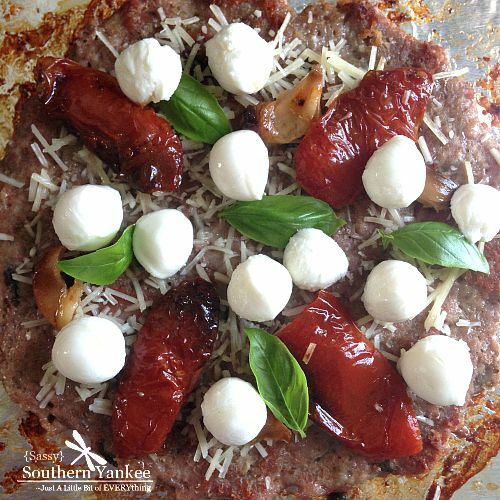 Bake for an additional 5 min or until the mozzarella is melted and bubbly. Drizzle with a bit of olive oil and fresh basil. If you wanted a bit more tomato flavor you could always add a bit of pizza sauce before adding the cheese. 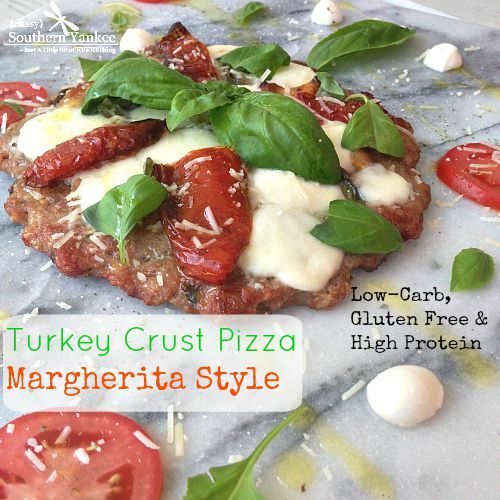 This entry was posted in Main Course and tagged bariatric recipes, Gluten Free, Healthy Meals, High Protein, Low Carb, Margherita, Pizza, Pizza Crust, Roasted Tomatoes, Turkey, Weight loss. Made it. It was pretty good. Definitely cured my craving for regular bread pizza! I made a few additions. 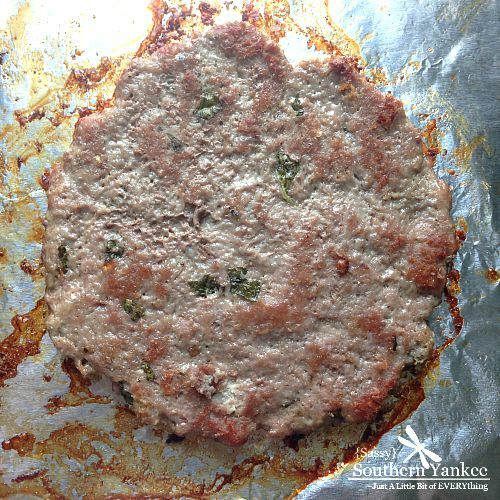 I added 1 tablespoon of coconut flour and 1/2 cup chopped mushrooms to the meat, along with 1 tablespoon of dried onions and dried herbs. Looks great! Do you think this could be made without the cheese to make it Whole30? You could always give it a try or perhaps vegan cheese? Not sure if that is whole 30. Hi, what are the nutritional values on this pizza….total servings, calories,net carbs, protein, fats per serving please? Pet Peeve, recipes that do not include nutritional information 🙁 The recipe is focused on low carb/high protein, yet do not provide those details.